My grocery stores seem to be stocked high with two things lately. Tomatoes and strawberries! So I thought I would combine the two in this Vegan Tomato Strawberry Gazpacho. Gazpacho is traditionally a Spanish chilled vegetable chilled soup, so I am taking just a few liberties here. It’s delicious nonetheless. This recipe is made up of simple, fresh and in-season ingredients. 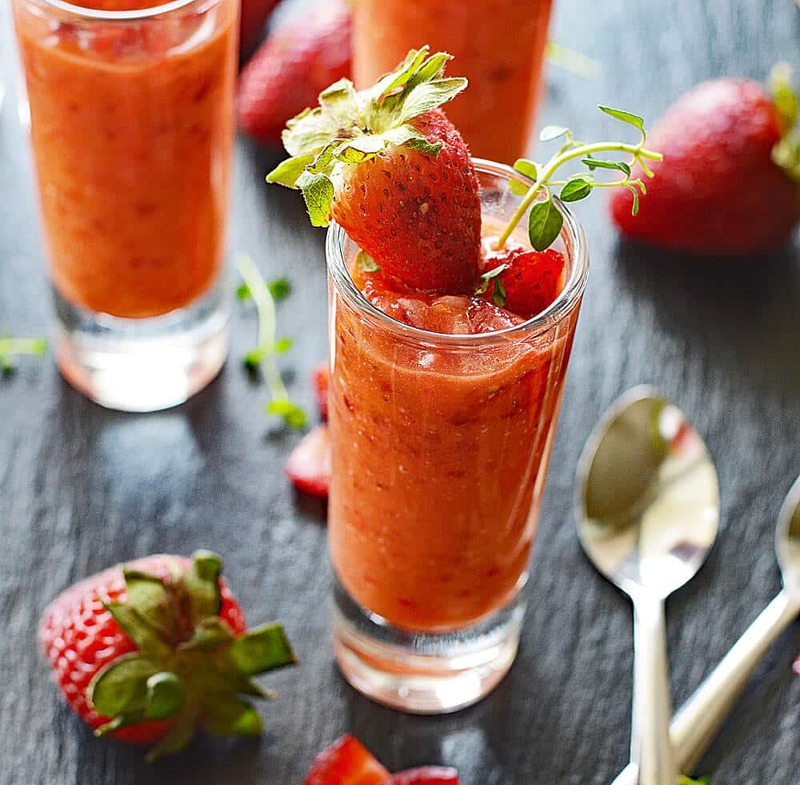 Tomatoes, strawberries, cucumber and red bell pepper are placed into the food processor and pulsed until coarsely chopped. You’ll reserve a portion of this for topping. The remainder is pureed with vegetable broth, garlic and thyme until velvety smooth. Cover and chill for at least 4 hours. Lastly, combine the reserved coarsely chopped mixture with olive oil, vinegar, salt and black pepper. I like to garnish it with a whole strawberry and a sprig of fresh thyme leaves. A little bit sweet, a little bit savory and a little bit of bite from the red pepper. It’s a really simple, yet elegant recipe. I used these dessert shooters that come with tiny spoons that are just the perfect size! This recipe serves about 6 of these 2.5 oz. dessert shooters. 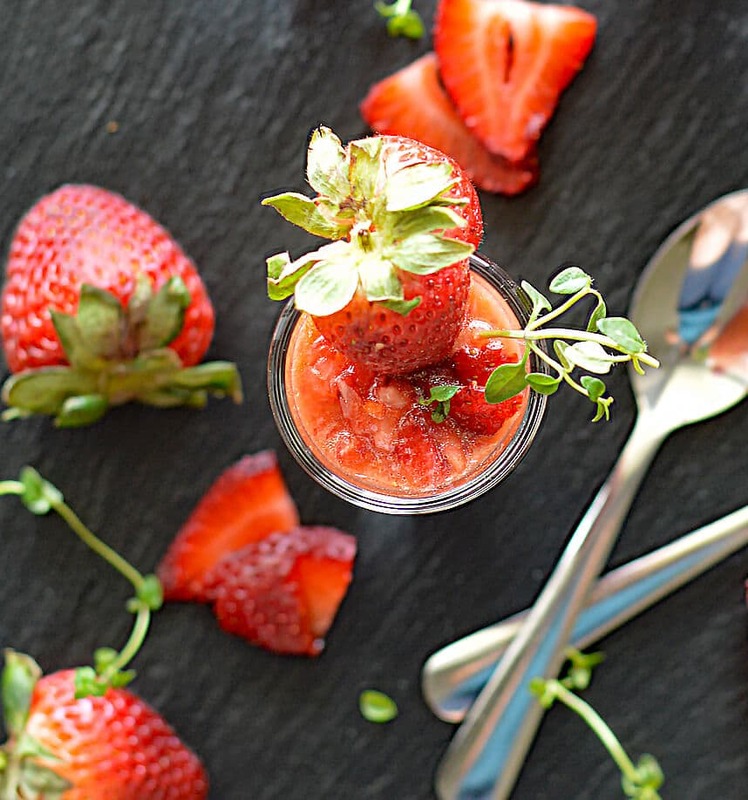 Did you make this recipe for Vegan Tomato Strawberry Gazpacho? Let me know what you thought in the comments section below. Recipe slightly adapted from Cooking Light, April 2016. Tomatoes, strawberries, cucumber and red bell pepper are placed into the food processor and pulsed until coarsely chopped. You'll reserve a 1/3 C of this for topping. Lastly, combine the reserved coarsely chopped mixture with olive oil, balsamic vinegar, salt and black pepper. I like to garnish it with a whole strawberry and a sprig of fresh thyme leaves. « Going Green: 12 Eco-Friendly Ways to Upcycle Your Coffee At Home!